The Camille & Henry Dreyfus Foundation 2017 Year in Review is now available. 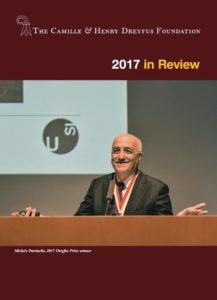 This brief report includes information about 2017 Dreyfus Prize winner Michele Parrinello, the upcoming ACS / Dreyfus symposium on Theoretical & Computational Chemistry, the Dreyfus Teacher-Scholar Conference, lectureships at the University of Basel & undergraduate institutions, 2017 award recipients, and 2018 program deadlines. Read it here.